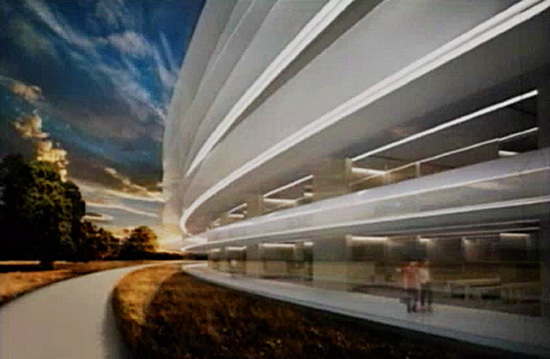 You’ve seen the concept art showing off the outside of Apple’s new wheel-shaped “mothership” campus. 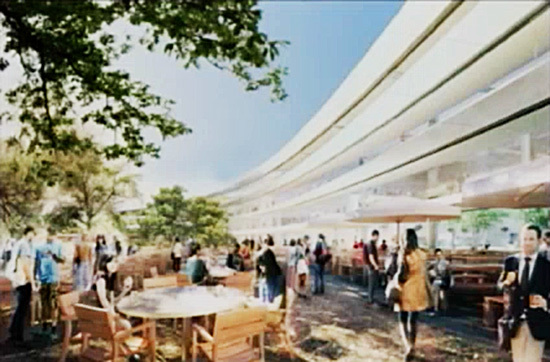 Now, here’s your very first look at what the inside of Apple Campus 2 will be like. 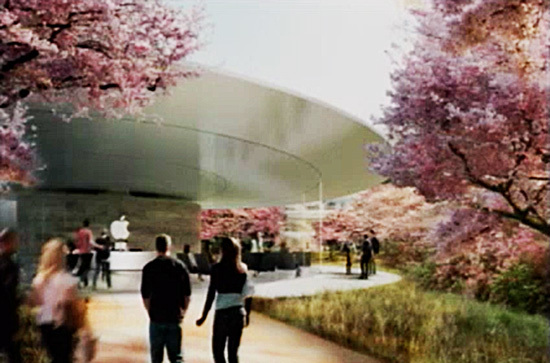 The city of Cupertino has posted video online of the October 1st meeting where Apple’s senior director of real estate and facilities, Dan Whisenhunt, presented the city council with new details on the campus ahead of their final approval vote. 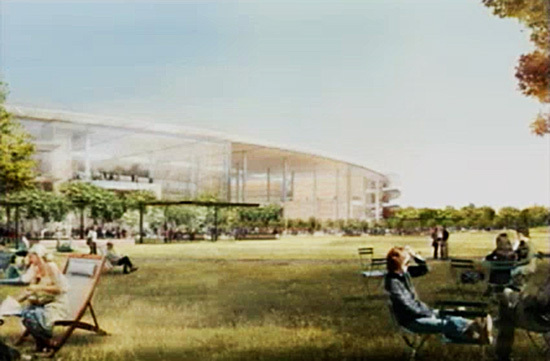 Included in that presentation was some brand new, never-before-seen concepts and renders that included some glimpses inside Apple Campus 2. A word of warning: The following images are screenshots taken from the video of that city council meeting. The video in question was filmed at a low resolution. The renders of AC2 seen in the video appear to have been recorded live from the projection screen on-site at the meeting. I’ve done what I can to clean up and enhance these images, yet they’re still a bit fuzzy and low in quality. But they’re all we’ve got, and they’re better than nothing! 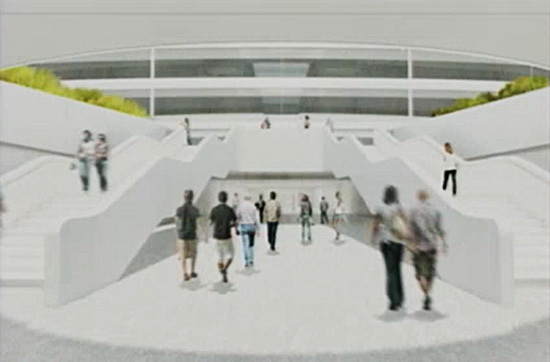 The inside of Apple Campus 2 will look a lot like you’d expect it to: white, clean, and ultra-modern. 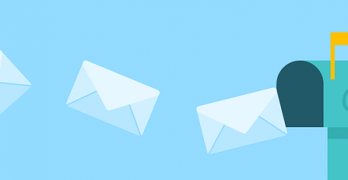 (How’d you like to be in charge of keeping a place like this clean?) Here’s a look at the front entrance and some office areas. 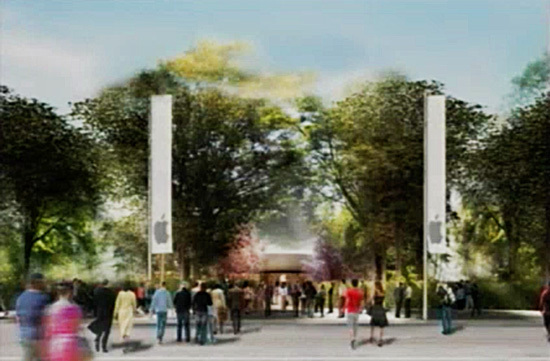 Note the product banners on the left, hanging over the main entrance much as they do at Apple’s Infinite Loop campus. 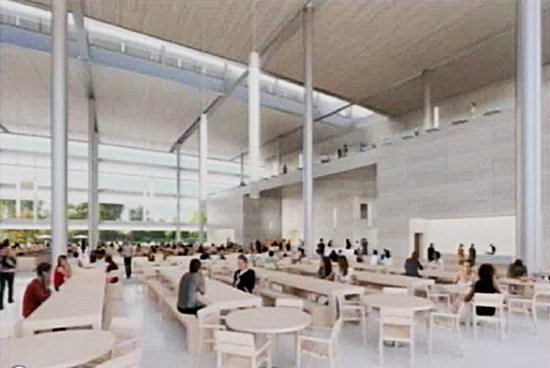 Now let’s look at the much-discussed cafeteria, which will seat up to 3,000 of the building’s 13,000 planned occupants. It comes complete with a massive basement kitchen situated directly underneath. Speaking of the Cafeteria, there’s more seating available right outside in the Courtyard area (that’s what Apple calls the outdoor center of the wheel). And here’s another look at the Courtyard. In the southwest corner of the new property, there’s going to be a massive parking garage — in addition to the extensive underground parking beneath the main building — where many employees will park each day. 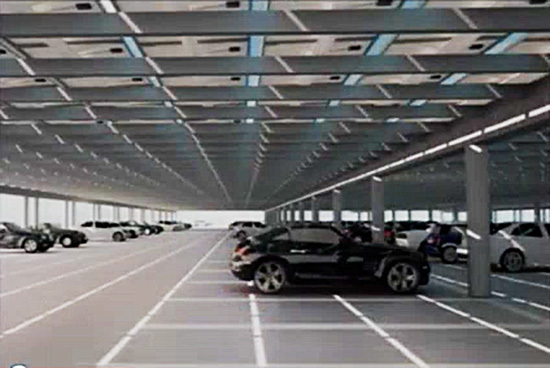 Even this parking structure is sleek and modern, as you can see below. It comes with thousands of LED lights. 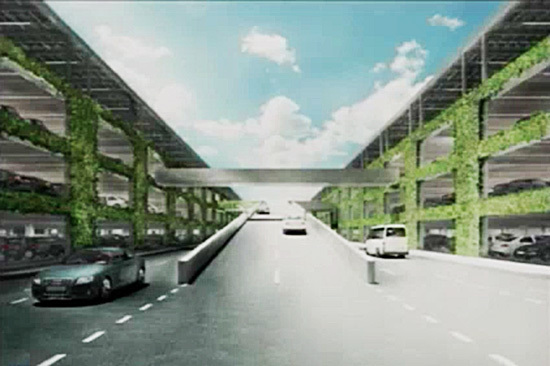 This one shows another side of the parking area, but I’m not sure exactly what we’re looking at. It could be the separate parking garage, or it could be the entrance to the underground garage. What jumps out at you is the greenery that looks like it’s adhered somehow to the walls. Do you suppose that’s actual plant life? 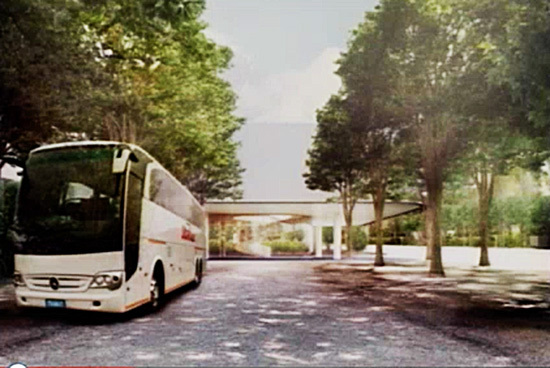 The new campus comes with a transportation hub area, where carpoolers and corporate buses can stop to load and unload passengers. Here’s a glimpse of it. Here’s where it opens out to the front entrance of the main building. 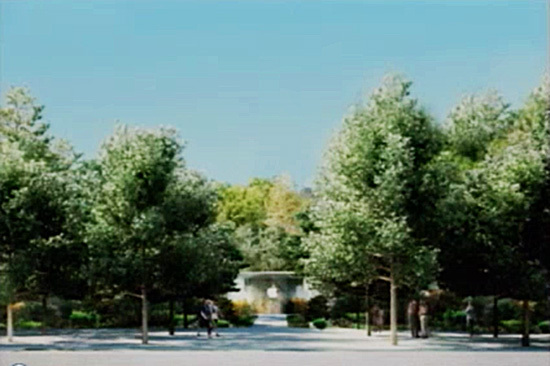 When visitors arrive, here’s the first thing they’ll see upon turning onto the street that leads into the complex. 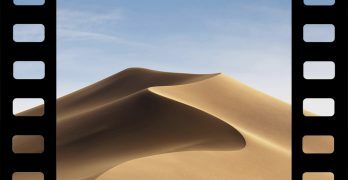 Note the glass-enclosed Apple logo at the end of the drive. 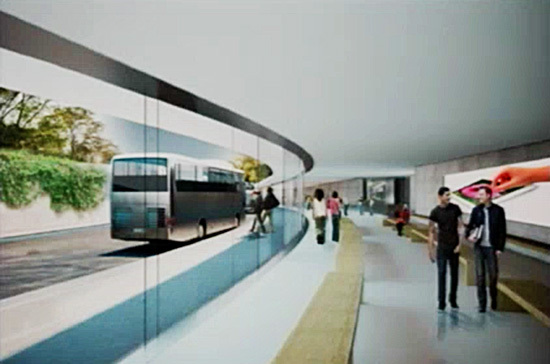 If you’re a visitor arriving by bus, your arrival will look something like this. Then there’s the Visitor’s Center itself. Here’s a view of how it will look to approach it on foot. Here’s the Visitor’s Center itself, which like the keynote auditorium, is circular and glass (only smaller). This is the first part of the campus proper that visitors will see. And speaking of the keynote auditorium, I showed you what it’s going to look like just last week, but here’s a new look at the inside. Even inside the above-ground lobby, it still looks like you’re standing under a hovering flying saucer! Here’s (slightly) closer look at the fitness center. Still can’t make out many details. Lastly, the meeting provided a few more looks at the mothership itself. I like this last one; it shows the big building lit up at night. Well, dusk anyway.